Marijuana tourism in the U.S.
A cannabinoid is one of a class of diverse chemical compounds that acts on cannabinoid receptors in cells that alter neurotransmitter release in the brain. Ligands for these receptor proteins include the endocannabinoids (produced naturally in the body by animals), the phytocannabinoids (found in cannabis and some other plants), and synthetic cannabinoids (manufactured artificially). The most notable cannabinoid is the phytocannabinoid tetrahydrocannabinol (THC), the primary psychoactive compound in cannabis. Cannabidiol (CBD) is another major constituent of the plant. There are at least 113 different cannabinoids isolated from cannabis, exhibiting varied effects. Synthetic cannabinoids encompass a variety of distinct chemical classes: the classical cannabinoids structurally related to THC, the nonclassical cannabinoids (cannabimimetics) including the aminoalkylindoles, 1,5-diarylpyrazoles, quinolines, and arylsulfonamides, as well as eicosanoids related to endocannabinoids. CB1 receptors are found primarily in the brain, more specifically in the basal ganglia and in the limbic system, including the hippocampus. They are also found in the cerebellum and in both male and female reproductive systems. CB1 receptors are absent in the medulla oblongata, the part of the brain stem responsible for respiratory and cardiovascular functions. CB1 is also found in the human anterior eye and retina. CB2 receptors are predominantly found in the immune system, or immune-derived cells with the greatest density in the spleen. While found only in the peripheral nervous system, a report does indicate that CB2 is expressed by a subpopulation of microglia in the human cerebellum. CB2 receptors appear to be responsible for the anti-inflammatory and possibly other therapeutic effects of cannabis seen in animal models. The classical cannabinoids are concentrated in a viscous resin produced in structures known as glandular trichomes. At least 113 different cannabinoids have been isolated from the Cannabis plant To the right, the main classes of cannabinoids from Cannabis are shown. The best studied cannabinoids include tetrahydrocannabinol (THC), cannabidiol (CBD) and cannabinol (CBN). All classes derive from cannabigerol-type compounds and differ mainly in the way this precursor is cyclized. The classical cannabinoids are derived from their respective 2-carboxylic acids (2-COOH) by decarboxylation (catalyzed by heat, light, or alkaline conditions). Tetrahydrocannabinol (THC) is the primary psychoactive component of the Cannabis plant. Delta-9-tetrahydrocannabinol (Δ9-THC, THC) and delta-8-tetrahydrocannabinol (Δ8-THC), mimic the actions of anandamide and 2-arachidonoylglycerol neurotransmitters produced naturally in the body. These cannabinoids produce the effects associated with cannabis by binding to the CB1 cannabinoid receptors in the brain. Cannabidiol (CBD) is non-psychotropic. Recent evidence shows that the compound counteracts cognitive impairment associated with the use of cannabis. Cannabidiol has little affinity for CB1 and CB2 receptors but acts as an indirect antagonist of cannabinoid agonists. It was found to be an antagonist at the putative new cannabinoid receptor, GPR55, a GPCR expressed in the caudate nucleus and putamen. Cannabidiol has also been shown to act as a 5-HT1A receptor agonist. CBD can interfere with the uptake of adenosine, which plays an important role in biochemical processes, such as energy transfer. It may play a role in promoting sleep and suppressing arousal. CBD shares a precursor with THC and is the main cannabinoid in CBD-dominant Cannabis strains. CBD has been shown to play a role in preventing the short-term memory loss associated with THC. There is tentative evidence that CBD had an anti-psychotic effect, but research in this area is limited. Cannabigerol (CBG) is non-psychoactive but still affects the overall effects of Cannabis. CBG has been shown to promote apoptosis in cancer cells and inhibit tumor growth in mice. It acts as an α2-adrenergic receptor agonist, 5-HT1A receptor antagonist, and CB1 receptor antagonist. It also binds to the CB2 receptor. Cannabichromene (CBC) is non-psychoactive and does not affect the psychoactivity of THC. CBC has shown antitumor effects in breast cancer xenoplants in mice. More common in tropical cannabis varieties. Cannabinoid production starts when an enzyme causes geranyl pyrophosphate and olivetolic acid to combine and form CBGA. Next, CBGA is independently converted to either CBG, THCA, CBDA or CBCA by four separate synthase, FAD-dependent dehydrogenase enzymes. There is no evidence for enzymatic conversion of CBDA or CBD to THCA or THC. For the propyl homologues (THCVA, CBDVA and CBCVA), there is an analogous pathway that is based on CBGVA from divarinolic acid instead of olivetolic acid. Most classical cannabinoids are 21-carbon compounds. However, some do not follow this rule, primarily because of variation in the length of the side-chain attached to the aromatic ring. In THC, CBD, and CBN, this side-chain is a pentyl (5-carbon) chain. In the most common homologue, the pentyl chain is replaced with a propyl (3-carbon) chain. Cannabinoids with the propyl side-chain are named using the suffix varin, and are designated, for example, THCV, CBDV, or CBNV. Phytocannabinoids are known to occur in several plant species besides cannabis. These include Echinacea purpurea, Echinacea angustifolia, Acmella oleracea, Helichrysum umbraculigerum, and Radula marginata. The best-known cannabinoids that are not derived from Cannabis are the lipophilic alkamides (alkylamides) from Echinacea species, most notably the cis/trans isomers dodeca-2E,4E,8Z,10E/Z-tetraenoic-acid-isobutylamide. At least 25 different alkylamides have been identified, and some of them have shown affinities to the CB2-receptor. In some Echinacea species, cannabinoids are found throughout the plant structure, but are most concentrated in the roots and flowers. Yangonin found in the Kava plant has significant affinity to the CB1 receptor. Tea (Camellia sinensis) catechins have an affinity for human cannabinoid receptors. A widespread dietary terpene, beta-caryophyllene, a component from the essential oil of cannabis and other medicinal plants, has also been identified as a selective agonist of peripheral CB2-receptors, in vivo. Black truffles contain anandamide. Most of the phytocannabinoids are nearly insoluble in water but are soluble in lipids, alcohols, and other non-polar organic solvents. 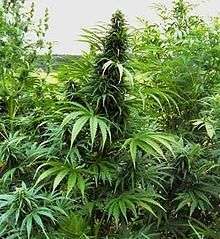 Quantitative analysis of a plant's cannabinoid profile is often determined by gas chromatography (GC), or more reliably by gas chromatography combined with mass spectrometry (GC/MS). Liquid chromatography (LC) techniques are also possible and, unlike GC methods, can differentiate between the acid and neutral forms of the cannabinoids. There have been systematic attempts to monitor the cannabinoid profile of cannabis over time, but their accuracy is impeded by the illegal status of the plant in many countries. Some is also stored in fat in addition to being metabolized in the liver. Δ9-THC is metabolized to 11-hydroxy-Δ9-THC, which is then metabolized to 9-carboxy-THC. Some cannabis metabolites can be detected in the body several weeks after administration. These metabolites are the chemicals recognized by common antibody-based "drug tests"; in the case of THC or others, these loads do not represent intoxication (compare to ethanol breath tests that measure instantaneous blood alcohol levels), but an integration of past consumption over an approximately month-long window. This is because they are fat-soluble, lipophilic molecules that accumulate in fatty tissues. Cannabinoids can be separated from the plant by extraction with organic solvents. Hydrocarbons and alcohols are often used as solvents. However, these solvents are flammable and many are toxic. Butane may be used, which evaporates extremely quickly. Supercritical solvent extraction with carbon dioxide is an alternative technique. Once extracted, isolated components can be separated using wiped film vacuum distillation or other distillation techniques. Anandamide was the first such compound was identified as arachidonoyl ethanolamine. The name is derived from the Sanskrit word for bliss and -amide. 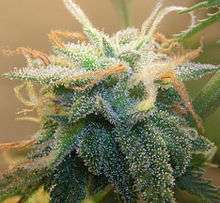 It has a pharmacology similar to THC, although its structure is quite different. Anandamide binds to the central (CB1) and, to a lesser extent, peripheral (CB2) cannabinoid receptors, where it acts as a partial agonist. Anandamide is about as potent as THC at the CB1 receptor. Anandamide is found in nearly all tissues in a wide range of animals. Anandamide has also been found in plants, including small amounts in chocolate. Two analogs of anandamide, 7,10,13,16-docosatetraenoylethanolamide and homo-γ-linolenoylethanolamine, have similar pharmacology. All of these compounds are members of a family of signalling lipids called N-acylethanolamines, which also includes the noncannabimimetic palmitoylethanolamide and oleoylethanolamide, which possess anti-inflammatory and orexigenic effects, respectively. Many N-acylethanolamines have also been identified in plant seeds and in molluscs. 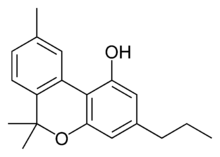 Another endocannabinoid, 2-arachidonoylglycerol, binds to both the CB1 and CB2 receptors with similar affinity, acting as a full agonist at both. 2-AG is present at significantly higher concentrations in the brain than anandamide, and there is some controversy over whether 2-AG rather than anandamide is chiefly responsible for endocannabinoid signalling in vivo. In particular, one in vitro study suggests that 2-AG is capable of stimulating higher G-protein activation than anandamide, although the physiological implications of this finding are not yet known. Recent evidence has highlighted lysophosphatidylinositol as the endogenous ligand to novel endocannabinoid receptor GPR55, making it a strong contender as the sixth endocannabinoid. Endocannabinoids serve as intercellular 'lipid messengers', signaling molecules that are released from one cell and activating the cannabinoid receptors present on other nearby cells. Although in this intercellular signaling role they are similar to the well-known monoamine neurotransmitters such as dopamine, endocannabinoids differ in numerous ways from them. For instance, they are used in retrograde signaling between neurons. Furthermore, endocannabinoids are lipophilic molecules that are not very soluble in water. They are not stored in vesicles, and exist as integral constituents of the membrane bilayers that make up cells. They are believed to be synthesized 'on-demand' rather than made and stored for later use. The mechanisms and enzymes underlying the biosynthesis of endocannabinoids remain elusive and continue to be an area of active research. When synthetic cannabinoids are used recreationally, they present significant health dangers to users. In the period of 2012 through 2014, over 10,000 contacts to poison control centers in the United States were related to use of synthetic cannabinoids. 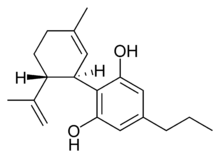 JWH-018, a potent synthetic cannabinoid agonist discovered by John W. Huffman at Clemson University. It is being increasingly sold in legal smoke blends collectively known as "spice". Several countries and states have moved to ban it legally. 1 2 3 4 Pacher, P.; Bátkai, S; Kunos, G (2006). "The Endocannabinoid System as an Emerging Target of Pharmacotherapy". Pharmacological Reviews. 58 (3): 389–462. doi:10.1124/pr.58.3.2. PMC 2241751 . PMID 16968947. 1 2 Lambert, Didier M.; Fowler, Christopher J. (2005). "The Endocannabinoid System: Drug Targets, Lead Compounds, and Potential Therapeutic Applications". Journal of Medicinal Chemistry. 48 (16): 5059–87. doi:10.1021/jm058183t. PMID 16078824. ↑ Pertwee, Roger, ed. (2005). Cannabinoids. Springer-Verlag. p. 2. ISBN 3-540-22565-X. ↑ "Bulletin on Narcotics – 1962 Issue 3 – 004". UNODC (United Nations Office of Drugs and Crime). 1962-01-01. Retrieved 2014-01-15. 1 2 Aizpurua-Olaizola, Oier; Soydaner, Umut; Öztürk, Ekin; Schibano, Daniele; Simsir, Yilmaz; Navarro, Patricia; Etxebarria, Nestor; Usobiaga, Aresatz (2016-02-02). "Evolution of the Cannabinoid and Terpene Content during the Growth ofCannabis sativaPlants from Different Chemotypes". Journal of Natural Products. 79 (2): 324–331. doi:10.1021/acs.jnatprod.5b00949. 1 2 Devane, WA; Dysarz, FA 3rd; Johnson, MR; Melvin, LS; Howlett, AC (1988). "Determination and characterization of a cannabinoid receptor in rat brain". Mol Pharmacol. 34 (5): 605–13. PMID 2848184. Retrieved 6 June 2015. ↑ Begg, Malcolm; Pacher, Pál; Batkai, Sándor; Oseihyiaman, Douglas; Offertaler, László; Mo, Fong Ming; Liu, Jie; Kunos, George (2005). "Evidence for novel cannabinoid receptors". Pharmacology & Therapeutics. 106 (2): 133–45. doi:10.1016/j.pharmthera.2004.11.005. PMID 15866316. ↑ Boron, Walter F.; Boulpaep, Emile L., eds. (2009). Medical Physiology: A Cellular and Molecular Approach. Saunders. p. 331. ISBN 978-1-4160-3115-4. ↑ Straiker, A., Maguire, G., Mackie, K., Lindsey, J. (1999) Localization of Cannabinoid CB1 Receptors in the Human Anterior Eye and Retina. Invest Ophth. Vis. Sci.40, 2442-2448. 1 2 Pacher, P.; Mechoulam, R. (2011). "Is lipid signaling through cannabinoid 2 receptors part of a protective system?". Progress in Lipid Research. 50 (2): 193–211. doi:10.1016/j.plipres.2011.01.001. PMC 3062638 . PMID 21295074. ↑ Núñez, Estefanía; Benito, Cristina; Pazos, M. Ruth; Barbachano, Antonio; Fajardo, Otto; González, Sara; Tolón, Rosa M.; Romero, Julián (2004). "Cannabinoid CB2 receptors are expressed by perivascular microglial cells in the human brain: An immunohistochemical study". Synapse. 53 (4): 208–13. doi:10.1002/syn.20050. PMID 15266552. ↑ Fellermeier, Monika; Eisenreich, Wolfgang; Bacher, Adelbert; Zenk, Meinhart H. (2001). "Biosynthesis of cannabinoids". European Journal of Biochemistry. 268 (6): 1596–1604. doi:10.1046/j.1432-1327.2001.02030.x. ISSN 0014-2956. PMID 11248677. 1 2 Iseger, TA; Bossong, MG (March 2015). "A systematic review of the antipsychotic properties of cannabidiol in humans.". Schizophrenia Research. 162 (1-3): 153–61. doi:10.1016/j.schres.2015.01.033. PMID 25667194. ↑ Mechoulam, Raphael; Peters, Maximilian; Murillo-Rodriguez, Eric; Hanuš, Lumír O. (2007). "Cannabidiol – Recent Advances". Chemistry & Biodiversity. 4 (8): 1678–92. doi:10.1002/cbdv.200790147. PMID 17712814. ↑ Ryberg, E; Larsson, N; Sjögren, S; Hjorth, S; Hermansson, N-O; Leonova, J; Elebring, T; Nilsson, K; Drmota, T; Greasley, P J (2009). "The orphan receptor GPR55 is a novel cannabinoid receptor". British Journal of Pharmacology. 152 (7): 1092–101. doi:10.1038/sj.bjp.0707460. PMC 2095107 . PMID 17876302. ↑ Russo, Ethan B.; Burnett, Andrea; Hall, Brian; Parker, Keith K. (2005). "Agonistic Properties of Cannabidiol at 5-HT1a Receptors". Neurochemical Research. 30 (8): 1037–43. doi:10.1007/s11064-005-6978-1. PMID 16258853. ↑ Campos A, Moreira F, Gomes F, Del Bel EA, Guimarães F (5 December 2012). "Multiple mechanisms involved in the large-spectrum therapeutic potential of cannabidiol in psychiatric disorders". Philos Trans R Soc Lond B Biol Sci. 367 (1607): 3364–3378. doi:10.1098/rstb.2011.0389. ↑ Frood, Arron. "Key ingredient staves off marijuana memory loss". Nature. Retrieved 6 October 2015. ↑ Mahadevan, Anu; Siegel, Craig; Martin, Billy R.; Abood, Mary E.; Beletskaya, Irina; Razdan, Raj K. (2000). "Novel Cannabinol Probes for CB1 and CB2 Cannabinoid Receptors". Journal of Medicinal Chemistry. 43 (20): 3778–85. doi:10.1021/jm0001572. PMID 11020293. ↑ Borrelli F, Pagano E, Romano B, Panzera S, Maiello F, Coppola D, De Petrocellis L, Buono L, Orlando P, Izzo AA (2014). "Colon carcinogenesis is inhibited by the TRPM8 antagonist cannabigerol, a Cannabis-derived non-psychotropic cannabinoid". Carcinogenesis. 35 (12): 2787–97. doi:10.1093/carcin/bgu205. PMID 25269802. 1 2 Cascio, MG; Gauson, LA; Stevenson, LA; Ross, RA; Pertwee, RG (2010). "Evidence that the plant cannabinoid cannabigerol is a highly potent α2-adrenoceptor agonist and moderately potent 5HT1A receptor antagonist". British Journal of Pharmacology. 159 (1): 129–41. doi:10.1111/j.1476-5381.2009.00515.x. PMC 2823359 . PMID 20002104. ↑ Baker, PB; Gough, TA; Taylor, BJ (1980). "Illicitly imported Cannabis products: Some physical and chemical features indicative of their origin". Bulletin on narcotics. 32 (2): 31–40. PMID 6907024. 1 2 Hillig, K. W.; Mahlberg, P. G. (2004). "A chemotaxonomic analysis of cannabinoid variation in Cannabis (Cannabaceae)". American Journal of Botany. 91 (6): 966–75. doi:10.3732/ajb.91.6.966. PMID 21653452. ↑ Thomas, Adèle; Stevenson, Lesley A; Wease, Kerrie N; Price, Martin R; Baillie, Gemma; Ross, Ruth A; Pertwee, Roger G (2005). "Evidence that the plant cannabinoid Δ9-tetrahydrocannabivarin is a cannabinoid CB1and CB2receptor antagonist". British Journal of Pharmacology. 146 (7): 917–26. doi:10.1038/sj.bjp.0706414. PMC 1751228 . PMID 16205722. ↑ Merkus, Frans W. H. M. (1971). "Cannabivarin and Tetrahydrocannabivarin, Two New Constituents of Hashish". Nature. 232 (5312): 579–80. doi:10.1038/232579a0. PMID 4937510. ↑ Ilan, A. B.; Gevins, A.; Coleman, M.; Elsohly, M. A.; De Wit, H. (2005). "Neurophysiological and subjective profile of marijuana with varying concentrations of cannabinoids". Behavioural Pharmacology. 16 (5–6): 487–96. doi:10.1097/00008877-200509000-00023. PMID 16148455. 1 2 Bauer, Rudolf; Salo-Ahen, Karin; Bauer, Outi (2008). "CB Receptor Ligands from Plants". Current Topics in Medicinal Chemistry. 8 (3): 173–86. doi:10.2174/156802608783498023. PMID 18289087. ↑ Bauer, R.; Remiger, P. (2007). "TLC and HPLC Analysis of Alkamides in Echinacea Drugs1,2". Planta Medica. 55 (4): 367–71. doi:10.1055/s-2006-962030. PMID 17262436. ↑ Raduner, S; Majewska, A; Chen, J; Xie, X; Hamon, J; Faller, B; Altmann, K; Gertsch, J (2006). "Alkylamides from Echinacea Are a New Class of Cannabinomimetics: CANNABINOID TYPE 2 RECEPTOR-DEPENDENT AND -INDEPENDENT IMMUNOMODULATORY EFFECTS" (PDF). J. Biol. Chem. 281 (20): 14192–14206. doi:10.1074/jbc.M601074200. PMID 16547349. ↑ Perry, Nigel; Van Klink, John; Burgess, Elaine; Parmenter, Graeme (2007). "Alkamide Levels inEchinacea purpurea: A Rapid Analytical Method Revealing Differences among Roots, Rhizomes, Stems, Leaves and Flowers". Planta Medica. 63 (1): 58–62. doi:10.1055/s-2006-957605. PMID 17252329. ↑ He, X; Lin, L; Bernart, MW; Lian, L (1998). "Analysis of alkamides in roots and achenes of Echinacea purpurea by liquid chromatography–electrospray mass spectrometry". Journal of Chromatography A. 815 (2): 205–11. doi:10.1016/S0021-9673(98)00447-6. ↑ Ligresti, A.; Villano, R.; Allarà, M.; Ujváry, I. N.; Di Marzo, V. (2012). "Kavalactones and the endocannabinoid system: The plant-derived yangonin is a novel CB1 receptor ligand". Pharmacological Research. 66 (2): 163–169. doi:10.1016/j.phrs.2012.04.003. PMID 22525682. ↑ Korte, G.; Dreiseitel, A.; Schreier, P.; Oehme, A.; Locher, S.; Geiger, S.; Heilmann, J.; Sand, P.G. (2010). "Tea catechins' affinity for human cannabinoid receptors". Phytomedicine. 17 (1): 19–22. doi:10.1016/j.phymed.2009.10.001. PMID 19897346. ↑ Gertsch, J; Leonti, M; Raduner, S; Racz, I; Chen, J; Xie, X; Altmann, K; Karsak, M; Zimmer, A (2008). "Beta-caryophyllene is a dietary terpene". PNAS. 105 (26): 9099–9104. doi:10.1073/pnas.0803601105. PMC 2449371 . PMID 18574142. ↑ Truffles contain endocannabinoid metabolic enzymes and anandamide Phytochemistry, Available online 26 November 2014. 1 2 Stout, Stephen M.; Cimino, Nina M. (2014-02-01). "Exogenous cannabinoids as substrates, inhibitors, and inducers of human drug metabolizing enzymes: a systematic review". Drug Metabolism Reviews. 46 (1): 86–95. doi:10.3109/03602532.2013.849268. ISSN 0360-2532. PMID 24160757. ↑ Aizpurua-Olaizola, Oier; Zarandona, Iratxe; Ortiz, Laura; Navarro, Patricia; Etxebarria, Nestor; Usobiaga, Aresatz (2016-01-01). "Simultaneous quantification of major cannabinoids and metabolites in human urine and plasma by HPLC-MS/MS and enzyme-alkaline hydrolysis". Drug Testing and Analysis: n/a–n/a. doi:10.1002/dta.1998. ISSN 1942-7611. ↑ Ashton CH (February 2001). "Pharmacology and effects of cannabis: a brief review". Br J Psychiatry. 178 (2): 101–106. doi:10.1192/bjp.178.2.101. PMID 11157422. Because they are extremely lipid soluble, cannabinoids accumulate in fatty tissues, reaching peak concentrations in 4-5 days. They are then slowly released back into other body compartments, including the brain. They are then slowly released back into other body compartments, including the brain. Because of the sequestration in fat, the tissue elimination half-life of THC is about 7 days, and complete elimination of a single dose may take up to 30 days. ↑ Katona I, Freund TF (2012). "Multiple functions of endocannabinoid signaling in the brain". Annual Review of Neuroscience. 35: 529–58. doi:10.1146/annurev-neuro-062111-150420. PMC 4273654 . PMID 22524785. 1 2 3 Grotenhermen, Franjo (2005). "Cannabinoids". Current Drug Target -CNS & Neurological Disorders. 4 (5): 507–530. doi:10.2174/156800705774322111. ↑ Martin, B.R. ; Mechoulam, R.; Razdan, R.K. (1999). "Discovery and characterization of endogenous cannabinoids". Life Sciences. 65 (6–7): 573–595. doi:10.1016/S0024-3205(99)00281-7. ↑ Di Tomaso, Emmanuelle; Beltramo, Massimiliano; Piomelli, Daniele (1996). "Brain cannabinoids in chocolate". Nature. 382 (6593): 677–8. doi:10.1038/382677a0. PMID 8751435. ↑ Chapman, K. D.; Venables, B; Markovic, R; Blair Jr, RW; Bettinger, C (1999). "N-Acylethanolamines in Seeds. Quantification of Molecular Species and Their Degradation upon Imbibition". Plant Physiology. 120 (4): 1157–64. doi:10.1104/pp.120.4.1157. PMC 59349 . PMID 10444099. ↑ Sepe, Nunzio; De Petrocellis, Luciano; Montanaro, Francesca; Cimino, Guido; Di Marzo, Vincenzo (1998). "Bioactive long chain N-acylethanolamines in five species of edible bivalve molluscs". Biochimica et Biophysica Acta (BBA) - Lipids and Lipid Metabolism. 1389 (2): 101–11. doi:10.1016/S0005-2760(97)00132-X. PMID 9461251. ↑ Piomelli, Daniele; Schweitzer, Nephi; Piomelli, Paul (1997). "A second endogenous cannabinoid that modulates long-term potentiation". Nature. 388 (6644): 773–8. doi:10.1038/42015. PMID 9285589. ↑ Savinainen, Juha R; Järvinen, Tomi; Laine, Krista; Laitinen, Jarmo T (2001). "Despite substantial degradation, 2-arachidonoylglycerol is a potent full efficacy agonist mediating CB1receptor-dependent G-protein activation in rat cerebellar membranes". British Journal of Pharmacology. 134 (3): 664–72. doi:10.1038/sj.bjp.0704297. PMC 1572991 . PMID 11588122. ↑ Hanuš, Lumír; Abu-Lafi, Saleh; Fride, Ester; Breuer, Aviva; Vogel, Zvi; Shalev, Deborah E.; Kustanovich, Irina; Mechoulam, Raphael (2001). "2-Arachidonyl glyceryl ether, an endogenous agonist of the cannabinoid CB1 receptor". Proceedings of the National Academy of Sciences. 98 (7): 3662–5. doi:10.1073/pnas.061029898. PMC 31108 . PMID 11259648. ↑ Oka, Saori; Tsuchie, Akiko; Tokumura, Akira; Muramatsu, Mayumi; Suhara, Yoshitomo; Takayama, Hiroaki; Waku, Keizo; Sugiura, Takayuki (2003). "Ether-linked analogue of 2-arachidonoylglycerol (noladin ether) was not detected in the brains of various mammalian species". Journal of Neurochemistry. 85 (6): 1374–81. doi:10.1046/j.1471-4159.2003.01804.x. PMID 12787057. ↑ Bisogno, Tiziana; Melck, Dominique; Bobrov, Mikhail Yu. ; Gretskaya, Natalia M.; Bezuglov, Vladimir V.; De Petrocellis, Luciano; Di Marzo, Vincenzo (2000). "N-acyl-dopamines: Novel synthetic CB1 cannabinoid-receptor ligands and inhibitors of anandamide inactivation with cannabimimetic activity in vitro and in vivo". Biochemical Journal. 351 (3): 817–24. doi:10.1042/bj3510817. PMC 1221424 . PMID 11042139. ↑ Bisogno, T; Ligresti, A; Dimarzo, V (2005). "The endocannabinoid signalling system: Biochemical aspects". Pharmacology Biochemistry and Behavior. 81 (2): 224–38. doi:10.1016/j.pbb.2005.01.027. PMID 15935454. ↑ Ralevic, Vera (2003). "Cannabinoid modulation of peripheral autonomic and sensory neurotransmission". European Journal of Pharmacology. 472 (1–2): 1–21. doi:10.1016/S0014-2999(03)01813-2. PMID 12860468. ↑ Porter, A. C.; Sauer, JM; Knierman, MD; Becker, GW; Berna, MJ; Bao, J; Nomikos, GG; Carter, P; Bymaster, FP; Leese, AB; Felder, CC (2002). "Characterization of a Novel Endocannabinoid, Virodhamine, with Antagonist Activity at the CB1 Receptor". Journal of Pharmacology and Experimental Therapeutics. 301 (3): 1020–4. doi:10.1124/jpet.301.3.1020. PMID 12023533. ↑ Piñeiro, Roberto; Falasca, Marco (2012). "Lysophosphatidylinositol signalling: New wine from an old bottle". Biochimica et Biophysica Acta (BBA) - Molecular and Cell Biology of Lipids. 1821 (4): 694–705. doi:10.1016/j.bbalip.2012.01.009. PMID 22285325. ↑ Fride, E; Bregman, T; Kirkham, TC (2005). "Endocannabinoids and food intake: Newborn suckling and appetite regulation in adulthood". Experimental biology and medicine. 230 (4): 225–34. PMID 15792943. ↑ ElSohly, Mahmoud A.; Gul, Waseem; Wanas, Amira S.; Radwan, Mohamed M. (2014-02-27). "Synthetic cannabinoids: Analysis and metabolites". Life Sciences. Special Issue: Emerging Trends in the Abuse of Designer Drugs and Their Catastrophic Health Effects: Update on Chemistry, Pharmacology, Toxicology and Addiction Potential. 97 (1): 78–90. doi:10.1016/j.lfs.2013.12.212. ↑ Lauritsen, Kirstin J.; Rosenberg, Harold (2016-02-24). "Comparison of outcome expectancies for synthetic cannabinoids and botanical marijuana". The American Journal of Drug and Alcohol Abuse. 42 (4): 377–84. doi:10.3109/00952990.2015.1135158. ISSN 0095-2990. PMID 26910181. 1 2 "N-(1-amino-3-methyl-1-oxobutan-2-yl)-1-(cyclohexylmethyl)-1H-indazole-3-carboxamide(AB-CHMINACA), N-(1-amino-3-methyl-1-oxobutan-2-yl)-1-pentyl-1H-indazole-3-carboxamide (AB-PINACA)and[1-(5-fluoropentyl)-1H-indazol-3-yl](naphthalen-1-yl)methanone(THJ-2201)" (PDF). Drug and Chemical Evaluation Section, Office of Diversion Control, Drug Enforcement Administration. December 2014. ↑ "More medicinal uses for marijuana". Marijuana.org. October 18, 2005. Archived from the original on 2005-12-21. Retrieved 2014-01-15.